Mr. Khamphou, 40, lives in Lao Ngam district, Saravane Province. Having enrolled into the Resilient Livelihoods for the Poor (RLP) project on the 16th of June 2015, he chose to raise goats. The Resilient Livelihoods for the Poor project seeks to increase the economic security and resilience of the rural poor in Laos, a country where more than three quarters of the population lives in rural areas where poverty is particularly concentrated. Before becoming an RLP beneficiary, Mr. Khamphou’s wife was unemployed, and he was the sole breadwinner for his family of two daughters and one son. Once enrolled, he received one pregnant female goat between August and September in 2015 that gave birth to two babies. The only problem Mr. Khamphou has faced when raising goats has been foot and mouth disease, which the affected goats eventually recovered from. To feed the goats, he lets them roam free around the forest during the dry season and cuts leave for them himself during the raining season. In the future, Mr. Khamphou would like to increase his land, rebuild his house, and acquire a motorbike as well as a two-wheel tractor. He would also like to try raising cows, as many others in his village do so. His happiest memory is when he received the goats, as previously he had little work. The 14th September 2016 marks another first for the Association for Autism (AfA), with the official release of ‘Lao Autism Talks’, a Lao language mobile application, or app, which will assist people with limited speech abilities to communicate using a picture-based system. The launch was held at the Vientiane Autism Center and attended by representatives from the Association for Autism (AfA), the Lao IT Dev Company, Scope Global, the Embassy of Australia, the U.S. Agency of International Development (USAID), World Education Laos, and other disabled people’s organizations in Laos. ctionary by selecting from the 1,500-word library organised into 12 categories for easy use. For young children with autism, this app offers the opportunity to give voice to their ideas, needs and wants as their voca bulary grows from single words to using sentences. While the initial focus was assisting children with autism to communicate, the app can be utilised by a wider range people with disabilities; those who are hearing impaired, blind, suffering from an acquired brain injury after road accidents or recovering from a stroke. “It is great to see the collaboration between Lao organizations, specifically a non-profit association and local company, to create innovative solutions for people with disabilities”, said Alex Zvinakis, Acting Laos Country Office Director. The USAID-funded World Education Laos TEAM project supports AfA in its mission to represent the interests of persons with autism spectrum disorder (ASD) in Lao PDR by promoting their rights, improving their access to appropriate services, and providing them and their families with education, therapy, and training to better equip them to live full and productive lives. Families who have children diagnosed with autism and on a low income can contact AfA to apply to borrow tablets donated by TRUE Corp, but the app can be downloaded for free by anyone in Laos who has an appropriate mobile device (android device). The app will be available for free download through the Google Play Store on Friday, September 16, 2016. The optimal screen size for the app is seven inches. On 16 August 2016, the USAID-funded World Education Laos (WEL) TEAM project organized the fifth coordination meeting with 34 people participating including USAID, WEL and TEAM’s 15 sub-recipients. The meeting took place at the Learning House in Vientiane. Updates from TEAM Laos on overall recent progress were shared. In addition, the 4 TEAMs workshop (Colombia, Congo Ukraine and Laos) which will be held on 12-16 September 2016 was introduced, and the 3 new sub-recipients (the Asian Development with Disabled Persons (ADDP Japan), Inclusive Education Center (IEC) and the Faculty of Medical Technology (FMT)) had the opportunity to present their new TEAM projects. All others sub-recipients presented their latest achievements. 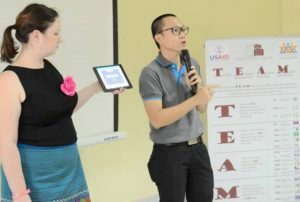 The Lao Association for Autism (AfA) presented their new app on tablet for Augmentative and Alternative Communication (AAC) called Lao Autism Talks that enables persons with autism spectrum disorder (ASD) to communicate and therefore helping to increase participation in family and social life. In addition, the new communication app drew a lot of attention from other sub-recipients. This innovative device could be useful for people with other types of speech and communication impairments as well. When summarizing the importance of this app development and praising the hard work of AfA and local IT company, Lao IT, Bernard Franck, WEL-TEAM Technical Director, said, “The development of this communication app “made in Laos” is a great example of creative and innovative solutions that can be developed locally to help people with impairment to better function in the day to day life”. The Quality of Life Association (QLA) presented their database specially designed for the case management of clients and demonstrated how it could be used in generating different data, reports and information about clients simply and effectively. In regards to communication capacity building support, the TEAM project also presented some tips on taking good technical photos/videos in order to help all sub-recipients capture the best photos to help them promote their activities and their achievements. Through the work of the TEAM project and its 15 sub-recipients, persons with disabilities will be empowered throughout Lao PDR. “The growing number and quality of synergies developed between actors through the TEAM model are amazing, and this meeting resulted in a lot of great exchange of information and good practices among all present.” said Bernard Franck, WEL-TEAM Technical Director. On August 4-5th 2016, ADDP Japan organized the first wheelchair basketball training and demonstration match under the USAID-funded World Education Laos (WEL) TEAM project. During two intensive days in the National Stadium, Luang Prabang, ADDP Japan staff and 5 highly skilled players from the Vientiane transferred their passion for basketball and motivated 10 young women and men with disabilities to gain techniques and enjoy the game. The 10 new players will eventually create a new Wheelchair Basketball team in Luang Prabang province. Spectators included officials from Provincial Education Service and Sports (PESS) and Provincial Labor and Social Welfare (PLSW) and WEL-TEAM project, and they were very impressed by the high level of motivation and quality of the skills of the new participants, particularly by the fervor of three new young women recruits. With the support of TEAM project, ADDP will create two new wheelchair basketball teams and train young potential players to be the members of provincial wheelchair basketball teams in Luang Prabang and also in Savannakhet. In addition, ADDP are refurbishing and repairing at least 20 used wheelchairs to donate to each province. “Wheelchair basketball is one of the most exciting sports among person with limited mobility and it is exciting to see the high level of enthusiasm to expand this sport beyond Vientiane,’ said Bernard Franck, Technical Director of WEL-TEAM project. The USAID-funded World Education TEAM project works with the Lao Disabled Women’s Development Centre (LDWDC) to provide vocational training to 67 women with disabilities from other provinces (in 3 batches over two years). In addition to vocational training in sewing, paper handicrafts or weaving, the students receive group psychosocial support, medical treatment, follow-up support for job placement, and grants for their own businesses. One of the students for the first batch who graduated in February 2016, Ms. Bao Khang, recently received a small grant to start her own clothing business. Ms. Bao Khang lives in Nonghet District, Xieng Khouang Province, and her new shop has been very successful. Sewing the skirts by herself, Ms. Bao Khang can make up to 10 skirts per day. The USAID-funded World Education TEAM project is proud to work with the Lao Disabled Women’s Development Centre to empower women to become independent role models in society. Marijua Wa (12-years-old) was admitted to the Lao Friends Hospital for Children (LFHC) for chronic burns from a gas explosion that had been sustained 5 months earlier. At the advice of a traditional healer, the family had applied a poultice of burned goat dung, and kept her on strict bedrest and severe dietary restriction (almost starvation) since the time of the accident. By the time she entered the hospital 5 months later, her wounds were still not healing, and she was severely malnourished and extremely deconditioned. Over several months, she has required intensive medical and wound care at LFHC, and also underwent a skin graft operation which was performed at the LPPH. During this time, she has received intensive physical therapy, including gradual strengthening, range of motion exercise, mobilization, conditioning, and gait training with parallel bars and then crutches. She has also received daily school lessons and recreational activities with our child life therapist, and has been learning to read, write and speak Lao. She has been followed closely by our nutritionist, and has been steadily gaining weight since her admission. Her family have been extremely involved in her care and rehabilitation, and have been an incredible asset and inspiration for her success. She is now ambulating safely with crutches, has dramatically improved her range of motion, and her wounds and skin grafts are healing well. LFHC is hoping to collaborate with the Provincial Rehabilitation Center to provide her with an orthotic solution to improve her gait. Recently, she and her family were able to go home for a few days on a temporary leave, and have now returned for a few weeks of continued care and discharge planning. Marijua Wa and her family are very grateful to both World Education’s TEAM project and LFHC for their unwavering care and support! On 4 August 2016, Voice of America News correspondent Daniel De Carteret published an article entailing the state of unexploded ordnance (UXO) in Laos, the number of UXO accidents that have occurred in Laos since the Vietnam War, and the number of UXO accident survivors in Laos currently receiving assistance. Currently, the Lao government estimates that there are about 15,000 people in Laos who have been injured by unexploded ordnance and are in need of support; however, there are few support services available. With plans for President Obama to announce an increase in funding for the UXO sector this coming September, it is hoped that the remaining thousands of UXO survivors receive the assistance they deserve. Read Mr. De Carteret’s article (via Voice of America). My name is Sybounheuang Sansathit, but everyone calls me Ki. I am a Prosthetist and Orthotist (P&O) at the Center for Medical Rehabilitation in Vientiane, Laos. I see about 15 patients per week. I enjoy working with people with disabilities, and see my clients smile after their new device is fitted. I was born and grew up in Xieng Khouang Province, in north-eastern Laos, a Province heavily bombarded by the Americans during the “secret war” that took place in parallel to the Vietnam War. The most common ordnances used were cluster munitions, containing hundreds of high-explosive bomblets, known in Laos as “bombies”. US bombing data indicates that more than 270 million bomblets w ere dropped on Laos. With a failure rate of 10-30%, an estimated 80 million remain on the ground and capable of harm, contaminating 25% of Laos’ villages, and 14 of the 17 Provinces. Growing up, I saw many UXO victims, people who had lost their legs or arms, or both. Because of their disability, they could not work, they were poor, they could not join social activities and felt excluded from society. I saw them suffer and wanted to do something to help. That’s why I decided to study prosthetics and orthotics. I was able to access a scholarship from the Nippon Foundation through the Cooperative Orthotic and Prosthetic Enterprise (COPE), a Lao non-profit organization working in partnership with the Centre for Medical Rehabilitation (CMR) to ensure that people with physical disabilities have local, free access to a quality, nationally-managed rehabilitation service. I studied at the Cambodian School of Prosthetic and Orthotic from 1999 to 2002. I then came back to Laos for on-the-job training and practice, and worked for one year in each of the rehabilitation centers in Champassak, Pakse and Xieng Khouang Provinces. In 2005, I was accepted by LaTrobe University to undertake higher education. There again, I received a Nippon Foundation scholarship through COPE. I graduated in September 2007 with a B.Sc. in P&O. As a Category 1 P&O diploma, I am one of the two P&O in Laos with qualifications recognized by the International Society for P&O. One of the main challenges I face in my job is that, because of limited resources, we are not always able to offer rehabilitation services at the level that I feel patients should receive. For instance, because of the lack of qualified P&O, it takes us longer to fabricate a prosthetic device than in other countries. Many of our patients are poor, subsistence farmers, and having to be away from their fields and wait for a device for 2 or 3 weeks means a financial big sacrifice for them. But regardless of the occasional frustration, I love my job. My parents had a furniture shop, and when I was young I spent a lot of time helping my father in the workshop. I liked working with tools and machinery, fabricating things. In a way, I still do this. But I do much more now, I work with people! I still remember this 25-year old woman who arrived at the center one day: because of a vascular disease, she had lost her four limbs. Her eyes were so sad, they had lost their shine and sparkle. All that was left was a dull, bleak gaze. She stayed at the center for six weeks, and had to train to use the two artificial legs and arms that we made for her. I will never remember her face when she walked again for the first time. It was as if she was reborn. Mr. Sounthone (center right) with World Education Laos Victim Assistance Support Team staff, Xieng Khouang Provincial Rehabilitation Centre staff, and a representative of his village leadership as he receives the livestock purchased with the livestock grant. May 2015. In May 2004, Mr. Sounthone was clearing upland rice fields with his wife’s relatives in Xieng Khouang province when his machete struck a cluster bomblet that was near the base of a small tree. The bomblet exploded, damaging his left hand and right leg. His left hand was amputated below the elbow, and he lost several toes on his right foot. Since the accident, Mr. Sounthone and his first wife got a divorce, and he has since moved to a new district and remarried. He and his second wife now have two children. Their primary source of income is paddy rice farming, but they do not produce enough to eat for the whole year. Mr. Sounthone supplements the family’s income from rice farming by cutting firewood to sell, and the family also grows some vegetables to sell. Despite these efforts, their family economic situation is still unstable. In May 2015, in collaboration with Government of Laos counterparts at the Xieng Khouang Provincial Rehabilitation Centre and the Xieng Khouang Provincial Hospital, World Education’s Victim Assistance and Support Team (VAST) selected Mr. Sounthone as a recipient for a livestock grant, supported by Union Aid Abroad APHEDA. Mr. Sounthone and his family were very pleased to receive the grant, with which they have purchased a cow and her calf. Before receiving the livestock grant, Mr. Sounthone attended an animal raising training and a financial literacy training organized by the Quality of Life Association. VAS team members will continue to monitor his progress with his new livestock.